instead of ethanol one can also use most of the other organic molecules containing a methyl group which borders on a alcohol, aldehyde, ketone or carboxylic acid function. Mix 3 spatula-tipfuls of sodium carbonate, approx. 3 ml of water, approx. 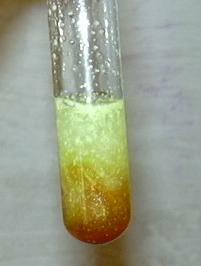 0.5 ml of ethanol and about 0.1-0.2 g of iodine in a test tube. A solution is not formed, the sodium carbonate and iodine remaining on the bottom of the glass. Warm the mixture with the burner until all of the iodine is consumed, i.e. until no further brown coloration appears. During the transformation iodoform visibly precipitates, and after cooling of the mixture is completely sedimented. One can save the iodoform for further experiments, or dispose of it as halogen-containing organic waste. The solution can be disposed in the drainage. The reaction, the mechanics of which are not completely clear, but which in any case involve an oxidation of alcohol, etc. into carboxylic acid, was previously used for the structural determination of organic molecules. During the reaction iodine dissolves and is rapidly transformed. 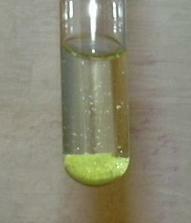 After the reaction the solution clarifies and iodoform is deposited. Described in numerous organic and pharmaceutical lab exercises. Use of sodium carbonate derived from 1574 L, "Jodoform", p. 295, .